My favourite piece is my bookshelf. It’s beige wood, with light green leaves painted on it, an antique I’ve had since I was five, stuffed with my favourite books: Heather O’Neill’s Lullabies For Little Criminals, Etgar Keret’s The Bus Driver Who Wanted to be God, the Zoe Whittall edited collection of stories called Geeks, Misfits and Other Outlaws, Lynn Crosbie’s Liar, Aryn Kyle’s Boys and Girl’s Like You and Me, and Jami Attenberg’s Instant Love. My collection of first editions is on the top shelf—Catcher in the Rye, Frankenstein, and Naked Lunch. I think they’re the first things I’d save in a house fire. On my mint green and silver leaf antique chair, there’s a pile of my old stuffed animals, including a white owl, a lime green Care Bear, and a two-dollar toy machine creature that resembles a cucumber with eyes. My mother asks me to go with her to St Lawrence Market with her. She does all her grocery shopping there once a week. It’s an olfactory assault: aromatic bread, salty fish, fresh sprouts, earthy vegetables, fragrant cheeses. There are actually three kinds of carrots (orange, yellow and aubergine, who knew?) 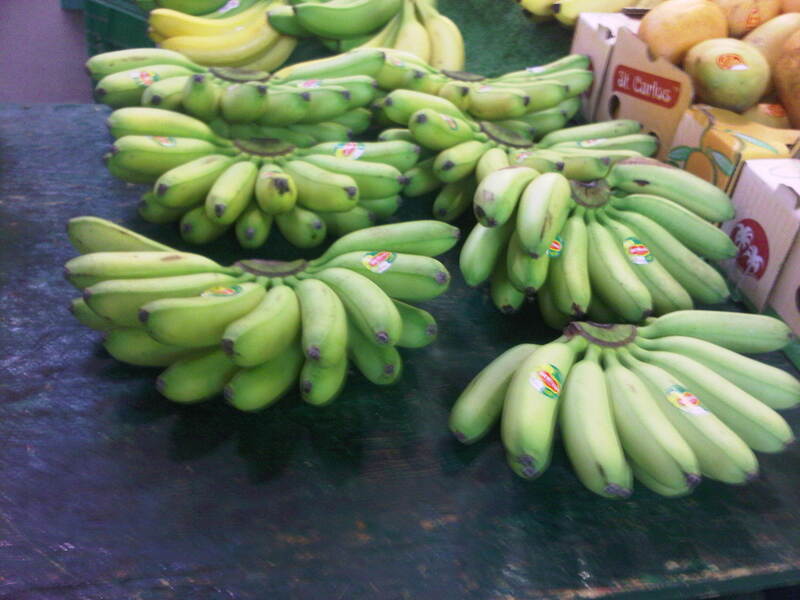 and tiny, finger-sized bananas. When he was four, twenty years ago, my brother refused to eat anything but tiny bananas. My father used to have to drive across Johannesburg to get them for him. I discover loaves of bread shaped like animals, one shaped like a goat, and another like a lamb. 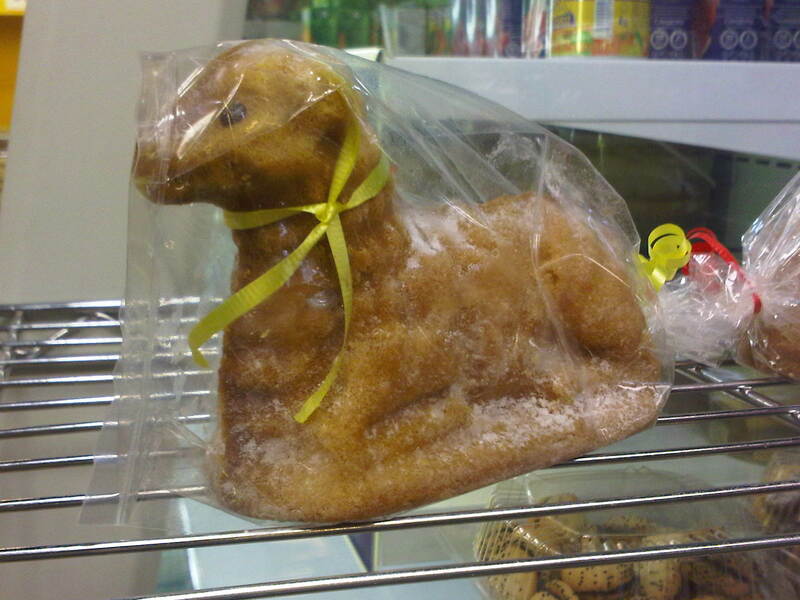 They combine a few of my favourite things: small animals, carbohydrates, and ribbons. (I decide not to buy any though because eating them seems criminal. These are culinary works of art. Instead I stock up on enough dried strawberries, cranberries, cherries, walnuts and soynuts to last at least a month. They’re tart and crunchy—nature’s candy. 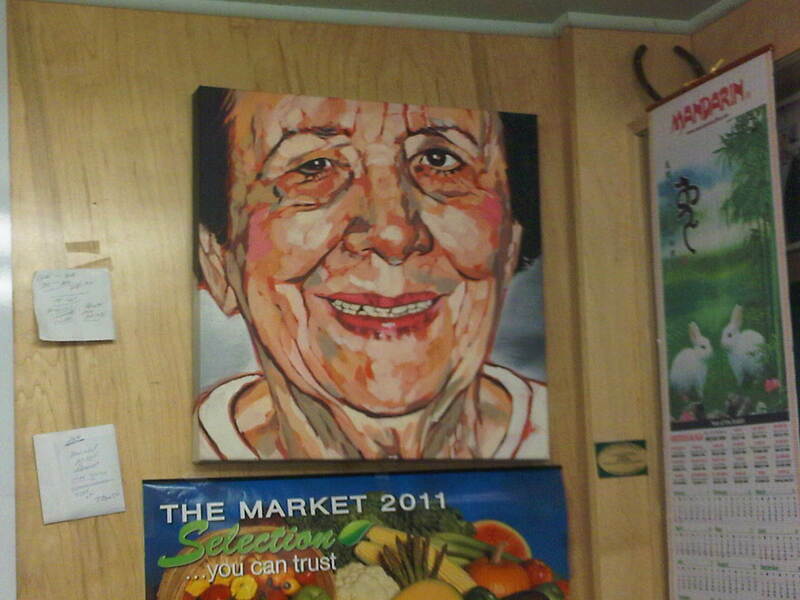 There’s a Lucian Freud-like acrylic portrait of a woman behind the counter. The different shades of flesh, the pinkness in her cheeks, the different textures of paint are so beautiful. The silver-tongued owner says that an Ontario College of Art and Design student painted it for his mother, Dora, who has since passed on. 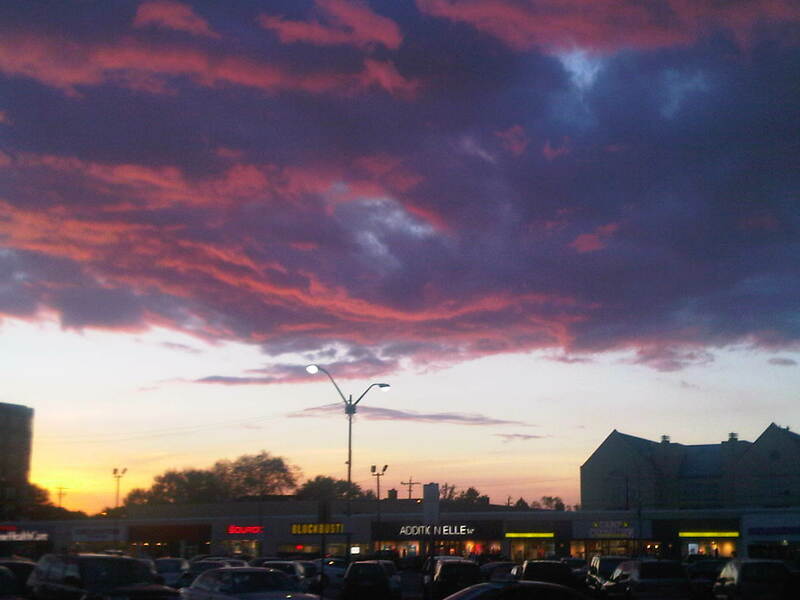 I go with friends to Wanda’s Pie in the Sky on Augusta Street. My friends order apple pie, and I have chocolate pecan pie. The apple pie looks golden and flaky, like an advertisement for the perfect dessert. I have a bite, and it actually tastes as good as it looks—warm, sugary, with a tiny kick of cinnamon. Mine tastes heavenly—moist, crunchy, honeyed but not too sweet. 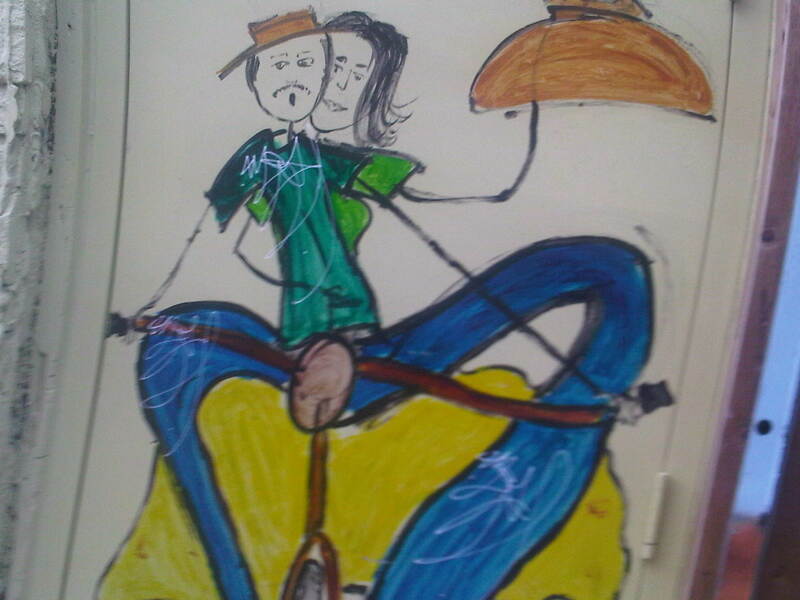 I also notice the artwork in the door way—a couple on a tandem bike—and smile. I’m a sucker for romantic cartoons, especially after being recently dumped. I head to the Annex to meet another friend. 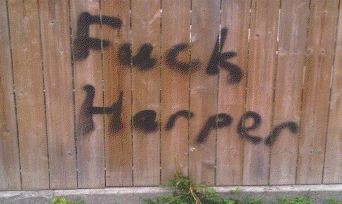 We went to high school together, and, when we were undergrads, we were neighbours in Harbord Village. We pass a new café off Borden Street—a few years ago this was my stomping ground. 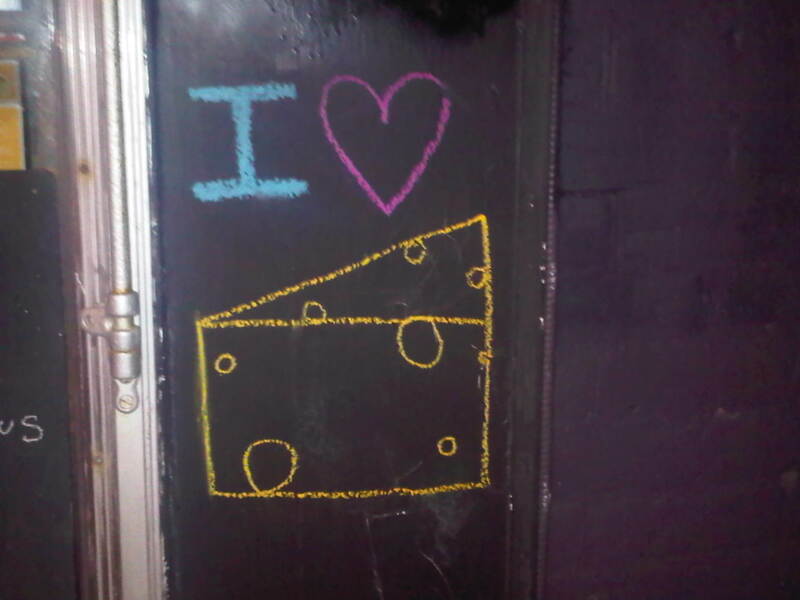 The café doorway has a sign that reads: I heart cheese. This is true on so many levels. I love cheese (brie, swiss, cream cheese, strawberry cream cheese) and I love cheesiness. I love lots of things without any irony. 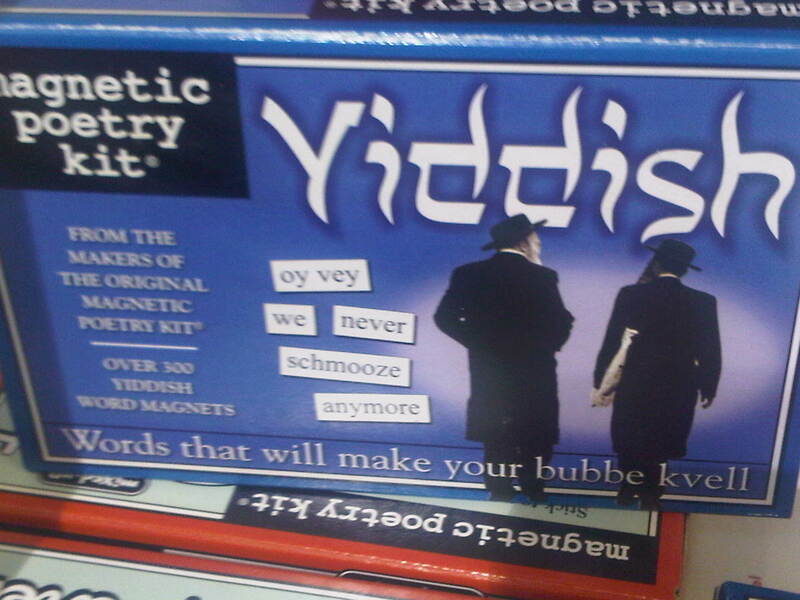 I love kitsch. I love reality tv. This doorway makes me happy so I photograph it. We have lunch at Fresh, a vegetarian place on Bloor, and afterwards, I stop at Midoco to check out their art supplies–pens, markers, acrylic paints. 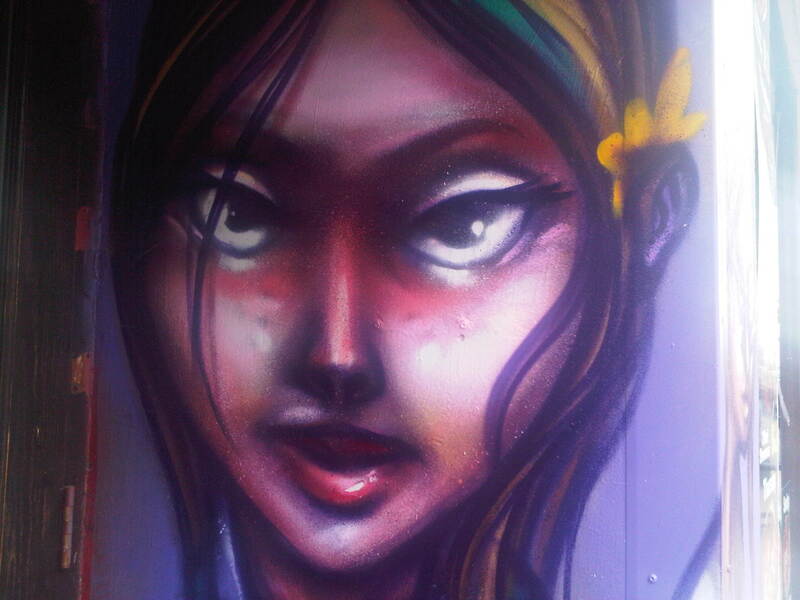 I see a graffiti mural a few doors down that inspires me: I love how feminine and mysterious she looks. 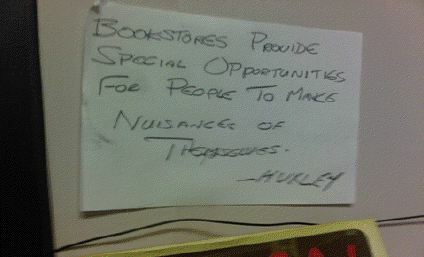 I also go to several bookstores, where I all but empty my wallet. The Annex is full of them—BMV (their $1 and $2 rack outside is incredible), Book City, Seekers, and my new discovery, Willow Books, at Bloor and St George. I find a book of essays by Hanif Kureishi (called The World and the Bomb) that I didn’t know existed. Plus, they had a really great sign. I wonder if I’m one such nuisance, with my plethora of requests for specific books (and my dream to one day own a library like the one in Disney’s Beauty and the Beast) but reassure myself that I at least buy a lot. My current favourite pieces are the political ones. 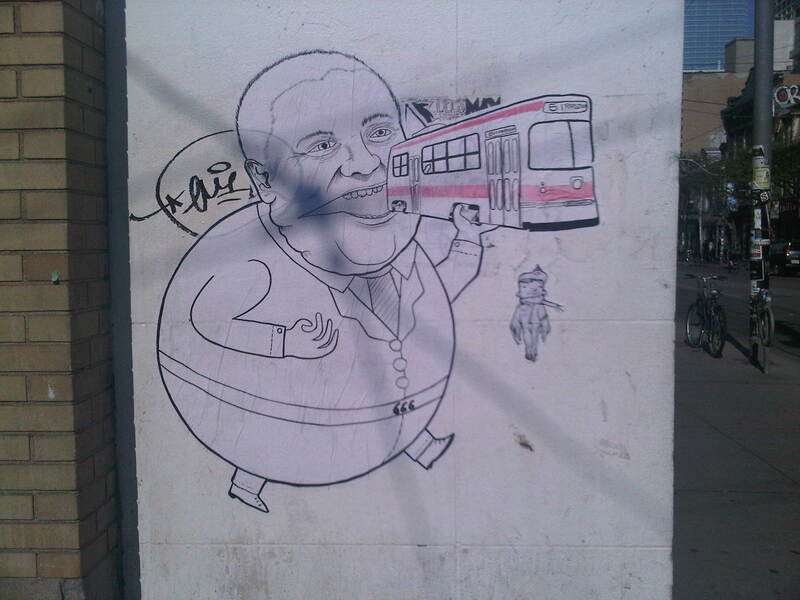 I think this parody of Rob Ford, the mayor of Toronto, seen on Queen Street, at the corner of McCaul, is great. I’ve never liked the media’s obsession with his weight (who cares? Fat or thin, it’s his actions that matter), but linking his weight to corporate greed, and Toronto Transit Commission cuts—that’s clever. I meet my friend Karen for Indian food at Everest. We order naan bread and vegetarian curries that are full of whole chunks of chilli peppers. My mouth is on fire but I can’t stop eating. That’s how I feel when I’m down here: exhausted and galvanized at once, fired up and inspired by all the art and subtext at every turn. I think might move down here again when I’m ready to move out. liked it! 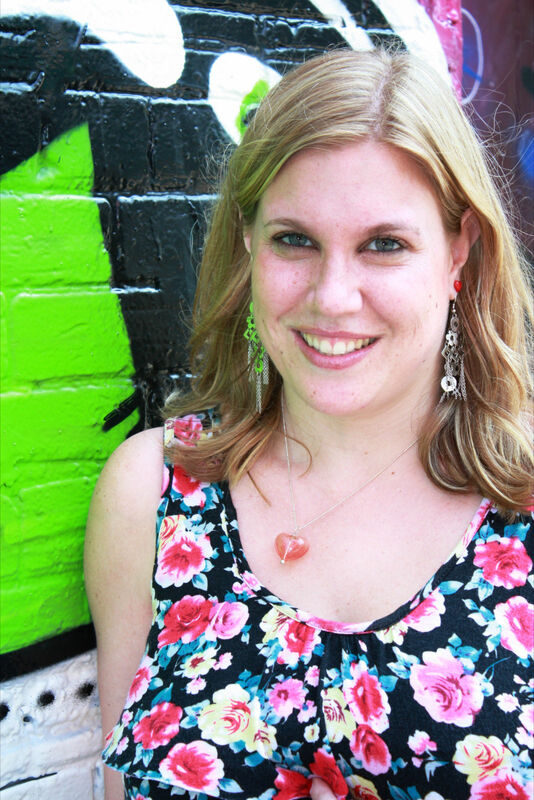 it is like strolling with the creative eyes wide open! catching every piece on the way! What a nice walk! I’ve been to Toronto once with my wife and in-laws (who live in Hamilton) and really enjoyed it, but it didn’t come alive to me quite as much as you’ve made it. Thank you!